House prices often spark lively debates at the dinner table, in bars or even on your commute. Everyone can search websites and see homes for sale at a variety of prices in any given area, but how do you find information on the average price they have sold for? 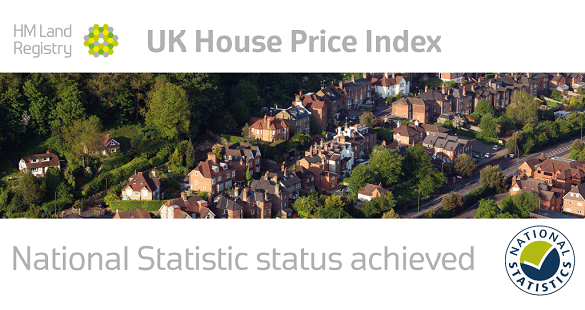 That’s where the UK House Price Index (UK HPI) comes in. With the UK HPI you can start with the average price, not the asking price. The data is supplied using the actual price paid for individual properties across the whole of the United Kingdom. The UK HPI has no bias. It uses housing market data to provide a transparent view of the housing market. The National Statistics badge indicates that the index has been independently assessed and meets the highest standards of trustworthiness, quality and value as defined in the Code of Practice for Statistics. It is a major achievement to be awarded National Statistic status from the Office for Statistics Regulation. The UK HPI is unique as a cross-government production by HM Land Registry, Land and Property Services Northern Ireland, the Office for National Statistics and Registers of Scotland, working together to create a dataset that contains information on registered residential property transactions that includes sales volumes, average prices by property type and cash/mortgage sales. I find what you do with the UK HPI to be fantastic. The Bank of England, the Treasury and other government departments use the data to help form policy decisions. The UK HPI was launched in June 2016 as an experimental statistic. User testing has been fundamental in creating and improving this release. In September 2016, users of the index were invited to complete a questionnaire to help evaluate various aspects of the report and associated data to improve the customer use. Further user events were held in England, Wales, Scotland and Northern Ireland, as well as direct calls and emails from stakeholders, which provided regular feedback and all fed into a final development phase implemented in January 2018. While achieving this statistical landmark is amazing, it doesn’t stop us from getting better. We have a programme of research and development aimed at improving and maintaining the UK HPI which forms our development plan. This ensures we continue to meet user needs, make use of new and innovative methods and are compliant with international standards. If you would like to share your feedback on the UK HPI, you can register to join our LinkedIn UK HPI group or contact us for more information. I975 was a particularly bad year for conveyancing. The Land Charges Registry broke down delaying house moving and post offices ran out of Land Registry stamps causing writer's cramp from cheque signing. The then Chief Land Registrar, Theodore Rudolf, bravely addressed the former problem with technology. He spoke to a rampantly hostile meeting at Croydon DLR where I said that this was the wrong approach and was applauded. Having been so wrong it says a lot for the tolerant attitude of LR that I am allowed to put forward views on your website only 43 years later. The tragedy was, however, that LR was not able to extend innovation for many years. You must now do so. Valuable data must be used to help citizen customers. Secondly. drafting quality should be assessed and published. Leases can be terrible documents. My own (drawn up less that 10 years ago) has no table of contents, index and section or clause headings. It raises suspicion that it was produced to hide information. I pointed out to my landlord that a rent demand had a date wrong. He had to ask me where the correct one appeared in the lease because he could not find this. And his signature was on the document. At the end of the last century, the Law Society produced a booklet on clear drafting starting with a condemnation of the unnecessary use of "demised" which confused lay-people. About the same time I received a draft of the lease for a right-to-buy. This was based on a very bad precedent made worse by the council/landlord adding the offending term, according to Word, 81 times! Keep up the good work. And extend it. Thank you for your kind comments and for your thoughts on the way forward which we will pass onto those involved. make it essential that the Land Registry's objective data about conveyancers' performance is made available to help your citizen clients make informed decisions when seeking professional services. These plans still stand and we will communicate more about this in the coming months. We will continue to open up our data to benefit the public that we serve.